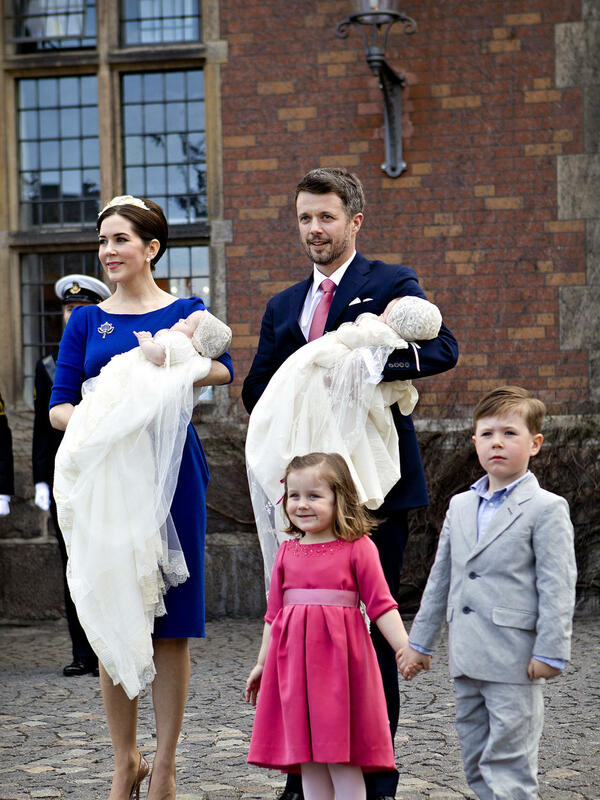 Nearly 300 guests crammed into the Holmen's Church in Copenhagen for the christening of the latest additions to the Danish royal family: twins Prince Vincent and Princess Josephine. 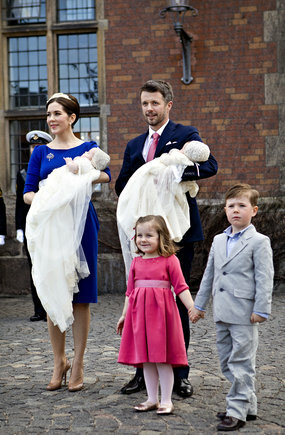 The youngest children of Crown Prince Frederik and Australian-born Crown Princess Mary were baptised Vincent Frederik Minik Alexander and Josephine Sofia Ivalo Mathilda. Following three months of speculation, the babies' names, a closely-kept secret since their birth on January 8, immediately became the top news story in Denmark. The children were each given one Greenlandic name, Minik and Ivalo, in honour of Denmark's autonomous territory, according to Danish media. The twins are fourth and fifth in line to the throne, after their father Frederik and their older siblings, five-year-old Prince Christian and Princess Isabella, who will turn four next week. Mary, 39, wearing a royal blue dress with a cream coloured head piece and 43-year-old Frederik carried the children dressed in white lace to the gilded baptismal font, with Christian and Isabella at their sides. Princess Mary's parents attended the ceremony along with the Danish royals, politicians and business leaders. Across the canal from the Holmen's Church, which dates back to 1563 and has been the site of numerous royal baptisms and weddings, the tower at Christiansborg Castle, the seat of Danish parliament, was festooned with a proud ring of the bold red and white Danish flag. And throughout the city on Thursday, Danish flags flew from city buses, bicycles and backpacks. There were more than a few Australian flags waving too in a tribute to Crown Princess Mary. "Congratulations on your Christening" read a big sign facing the residence of the royal couple, who met at the 2000 Summer Olympics in Sydney and were married in 2004 in Copenhagen. After the ceremony, the family's guests disembarked from the ferry jetty beside Holmen's Church and sailed back to the Amalienborg Castle for a private celebration.